Capture pristine cinema footage with Schneiders premium Xenon range of full-frame lenses. 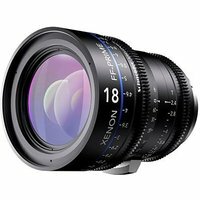 This 18mm lens features a bright aperture of T2.4 with 14 aperture blades, for beautiful, smooth bokeh. As all lenses in the range are built to the same dimensions users can easily switch between lenses without needing to recalibrate their rigs. This version displays metric units, and fits Canon cameras.